When our canine girls Cricket and Sheba were younger, we didn’t know a lot about feeding them healthy food. We did the best we could with what we knew at the time. Now we know so much more, and it’s been important to us to get Luke on a healthy track while he is still young. Feeding him (and now his sisters as well) grain free, protein rich foods is what’s working for us. This post is sponsored by Wellness® Natural Pet Food and the BlogPaws® Pet Influencer Network™. I am being compensated to help share the reinvented Complete Health Line and other Wellness Products, but we only share information we feel is relevant to our readers. Wellness is not responsible for the content of this article. Luke has some issues that sometimes limit what we can do with him. He loves to ride in the car but at times gets a little overstimulated and reactive – barking at everything he sees, including cars that are just following us! As we work on different ways to try to calm him down in the car, we limit his travels to shorter trips. Luke likes to run errands with the Dadz in his truck! We are pleased with how he’s been doing since we switched him to the Wellness® Complete Health™ Grain Free Line (if only food could fix his emotional issues!). He is lean and energetic, his digestion has been great, and his coat is soft and shiny. When we learned that PetSmart® carries many of the Wellness grain free products in their stores, we would have loved to take a drive and check it out for ourselves! But our closest store is an hour’s drive away. In addition to that, Luke is not a dog who can visit stores, he is too fearful of strangers. I have visited that store when on shopping trips with the girls, and I just love wandering the aisles looking at all of the fun pet products they carry. It’s great to see the people that bring in their own dogs for a visit. Maybe someday we will be able to do that with Luke, it’s something we strive for in training with him. What is it that attracts me to the Wellness food, other than the fact that Luke is doing so well on it? It goes beyond the bright and colorful bags that draw your eye when you see them on a store shelf, or in our case, on our computer screen – online is the way we do most of our pet shopping! Their team consists of a diverse group of animal lovers, nutritionists and vets with one mission: helping to provide our pets with healthy, happy, and long lives. They do whatever it takes to create the healthiest foods they can for their customers’ pets. In the 1990’s their team began working with animal nutrition experts, veterinarians and scientists to develop a food that would revolutionize the pet food industry; Wellness recipes for dogs were introduced in 1997 and cat recipes were added in 2000. They use high quality proteins sourced from trustworthy suppliers; deboned poultry, lean meats, and fresh fish. These quality sources of protein help build and maintain lean muscle mass. Healthy fats like chicken fat and salmon oil support healthy skin and coat and proper body function. A variety of fresh and dried fruits and vegetables that are rich in nutrients provide flavor and fiber. Prebiotics and probiotics keep intestinal bacteria in proper balance, leading to proper absorption of nutrients and helping to digest food more efficiently. We encourage you to seek out this food as well! Shopping online is OK, it’s what works for us living in a rural area without a lot of shopping variety. Given a choice I bet you’d also love to take your dog for a visit to your local store. With over 1300 stores in the USA, Canada, and Puerto Rico, you probably have one nearby; click here to search. 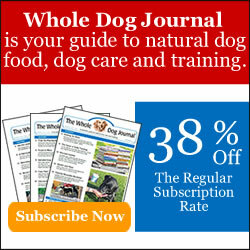 When you get there, you’ll find that Wellness offers a grain free option for every dog and every budget. Starting on July 6th and through the end of that month, Luke’s favorite Complete Health Products are $2.00 off! (Wellness also offers their Grain Free Core lineup, and that is $2.00 off for the month of June). If you’re like us, and shopping online is your only option, you can follow this link to find Wellness at PetSmart online. You can also follow Wellness on Twitter, Facebook, and Instagram. I’m also glad to have discovered Wellness and had an opportunity to try the CORE line, it’s such a big step up from foods not quite formulated with every ingredient in mind to contribute to the health of the dog. Great post! I haven’t been on PetSmart’s site in ages, but I’d be willing to bet Chewy’s prices for Wellness brands are much better. And I just noticed they have the cat food. I just can’t tell – I’m on my phone – if they have the small bags. You can always call and ask. Wellness is a great food, thanks for sharing. We got Sampson in 2004 and at some point between then and 2007 (when we got Delilah) we used Wellness. But back then, we didn’t know about grain free and all the other benefits, but like you we did the best we could with what we knew. We’d love to see a picture of you in your Dad’s truck, Dolly! We’ve always been fans of Wellness foods. We’re glad the dogs are doing well with it. I wanted to try Samantha on it, but haven’t been able to find smaller bags of the dry anywhere yet. I did pick up some cans to try though, but who knows if picky Sam will go for it or not! Wellness makes great products. We don’t eat their food, but we do eat their treats. We’ve been getting some of the treats lately too, and the crew loves them! We love our fishy flavored Wellness food. Even though Luke is eating the Lamb flavor right now, the fishy flavors are really the favorite around here – so we’ll probably switch to the fishy next time we need to get some! I have the utmost respect for the Wellness brand, and WellPet in general. The customer relations staff was always courteous and helpful when I contacted them. It’s the PetSmart store here by us (less than 2 miles away) that soured me on buying any food – especially dry stuff – from them. After that experience, well, you know how I feel. Now when I need an emergency supply of food in between my Chewy orders, I go to the Petco about 7 miles away, or the vet. I would love to put Shadow back on the Core brand, but I can’t. She can’t handle it. Oh well. As long as she’s doing well on what she’s eating now, I won’t make any changes. I’m glad the Wellness brands are working well for Cricket, Luke, and Sheba! At least they’re affordable as well as being higher-quality! Even with Chewy’s prices, I couldn’t afford some of the highest-end products even if the girls could handle them. We were happy enough with the last food we had them on, but the Wellness is so much more affordable. Plus I think it’s good to switch every once in a while (unless they have stomach issues like your girls, then you’re probably safer sticking with what you know works). We don’t have any big pet supply stores in our area. We have one good supply place, but they can be pricey, and they are inconsistent with what they carry. More than once they’ve stopped carrying what we were feeding and I had to find it elsewhere. It is amazing, isn’t it? I’m glad that you are a fan as well, because I know you only give quality food to your two! Barley loves the Wellness treats! Soth rejected their cat food–but he’s very picky about what he likes and when he likes it. There’s a good chance he’d be willing to eat it if we tried again some day. Thanks for sharing this info so we could learn a little more about the company–it makes me even happier that Barley enjoys the treats so much. We’ve been getting a lot of their treats lately too, and the crew loves them. I’d like to try Samantha on their food as well, but she is also picky so it’s tough. I did pick up some cans of food to try, and we’ll see how it goes. I love to know when companies are quality and trustworthy too, so I’m happy to share when I find one that is! She liked the first can we gave her! If the second is a hit, we can buy a whole case which would be great. It’s tough to keep track of so many different ingredients. I think that’s another reason it’s good to find a company that you feel like you can trust not to put that garbage in their foods!